From the campfire to the concert hall, singing in rounds and canons is one of the most enjoyable experiences for singers of all ages. As music teachers, we know that successful harmony doesn't just happen. It occurs over time with lots of practice and encouragement. This collection of rounds and canons is a sequential repertoire of kid-tested, no-fail songs to guide students through that developmental process of finding their voices in successful harmony. It includes movement and percussion echoes, rounds and canons; speech canons; call and response songs; and song rounds and canons. 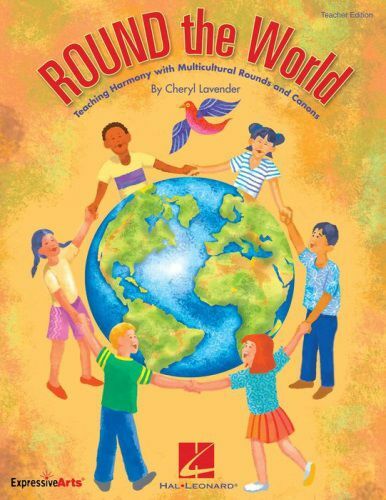 ROUND the World is also a multicultural collection so that students can experience the music of their world brothers and sisters, and have a greater understanding of their cultural stories and traditions. The Teacher Edition features reproducible song melodies with chord symbols, song background, performance tips, piano/vocal arrangements and a variety of reproducible classroom instrument parts for accompanying options. The Performance/Accompaniment CD is available separately or in a Classroom Kit with the Teacher Edition for more budget-saving value! Available separately: Teacher, Performance/Accompaniment CD, and Classroom Kit (Teacher and P/A CD). Suggested for grades 2-5.